The Sign-in Reconciliation activity allows organizations offering live, in person training to manage and report on participation of the live event within the LMS. This includes the ability to issue certificates based on attendance and to have those certificates stored in the users’ My Certificates block. 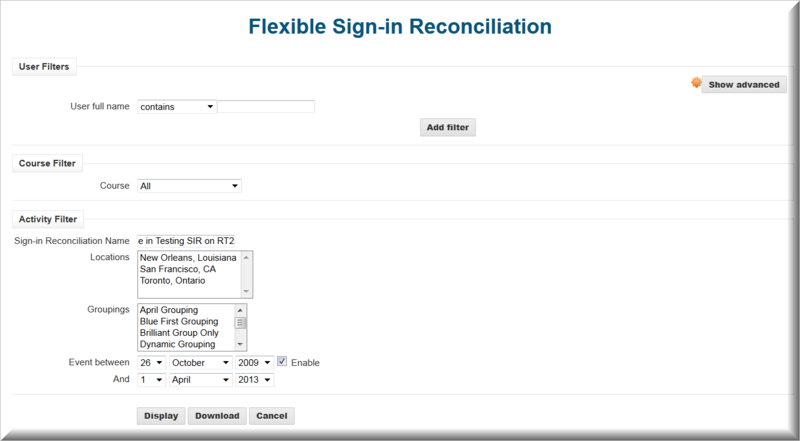 Sign-In Reconciliation for live events is a standard activity option in courses on the Refined Training Platform. Before a Sign-In Reconciliation can be added to a course, an administrator must specify one or more physical locations where their events occur. Specify the city or event location Name (for examples: Washington, DC or The Hyatt Regency, Burlingame, CA) and select the Time Zone of the location from the drop down menu. Click on Save changes. The time zone will display on the course page as part of the iconic display for the activity always indicating the time of the event in accordance to the location. Complete the required fields and select a certificate which can be emailed automatically to participants depending upon certificate settings. If you are issuing certificates as part of this activity the certificates must be created before the meeting is created. This is of greater importance when using the back up and restore functionality to ensure the settings are properly restored. 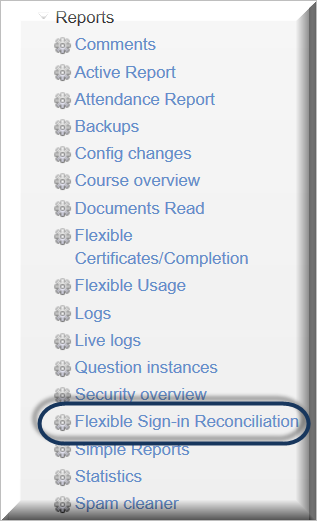 The certificate must first be created on the course page for it to be available as a drop down option within the Sign-in Reconciliation activity. Credits can be any one, two or three-digit number. Next select the size of the standard icon, or select the option to use a custom icon, and the Icon Position on the page (left, right or center); you can also add Extra HTML to enhance the iconic appearance and provide additional information to the end user. The recommended standard size for the icon is 120px by 120px. A higher density image will display better, 100 dpi or more but not more than 300 dpi. 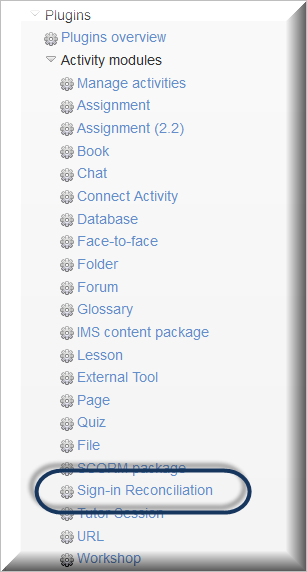 The live events that are created as activities can be link the LMS calendar allowing Refined Reminders to be sent to participants at specified intervals. 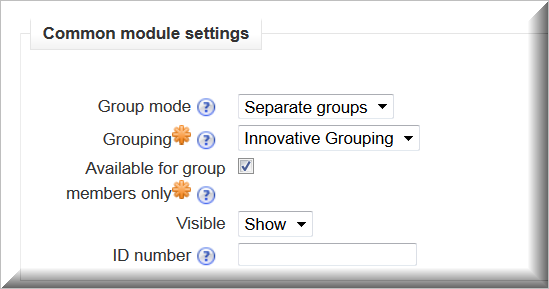 The grouping name will display on the administrative view of the course page and certificates will respect the grouping assignment. If a Grouping is associated with the event, only members of that Grouping will appear in the list and only that Grouping will receive certificates and reminders sent out by the LMS about the event. There are two options available to indicate attendance, issue certificates and specify credits received. The first option is to select an option for all attendees click on the check boxes at the top of the Attended and Certificate columns, this will enable all the checkboxes in that column for all attendees in the list. Inserting a number of credits in the top field in the credit column will award everyone in the list the same number of credits. To alter individual records you can unselect or clear individual boxes for the attendees who did not meet the criteria selected. Save changes before navigating away from the page. Once the attendance for the event has been added, an Admin or course Teacher can modify the records when required. Save the file with a unique name. To mark an attendee present, put a 1 in the attended column; a zero means they did not attend. If they met the criteria to receive a certificate for the event (such as attending for a set number of hours), put a 1 in the ifcert column; a zero means they did not meet the criteria and will not be issued a certificate. Finally, enter the number of credit hours (one or two digits only) earned. Partial attendance can be indicated by some number less than the credit number you originally designated for the event. After the event, click on the up arrow to upload the completed attendance CSV file. This file will automatically populate the Attendance list and issue a certificate to attendees who met the criteria for the certificate (if you selected a certificate to be automatically emailed). Participants whose names appear in black type have attended the event and met the criteria for successful attendance. Participants whose names appear in red have either not attended or did not earn sufficient credits. If upon reviewing the Sign-in Reconciliation form, you notice a mistake, you can go back to the activity, click on the green check icon, or update the csv file and edit the attendance for one or more participants. You can click on the top check box under Attended and Certificate to mark all participants present or to indicate that all participants earned the certificate. The top box under Credits allows you to give all participants the same number of credits. Clicking on these boxes a second time removes all records and credits for everyone. Click on Save changes. The administrator will then need to issue the certificate manually, by using the Log in as feature to log in as the user(s) and access the certificate inside the course. The attendance results from the live event can be used to unlock subsequent content, such as certificates, quizzes and presentations. 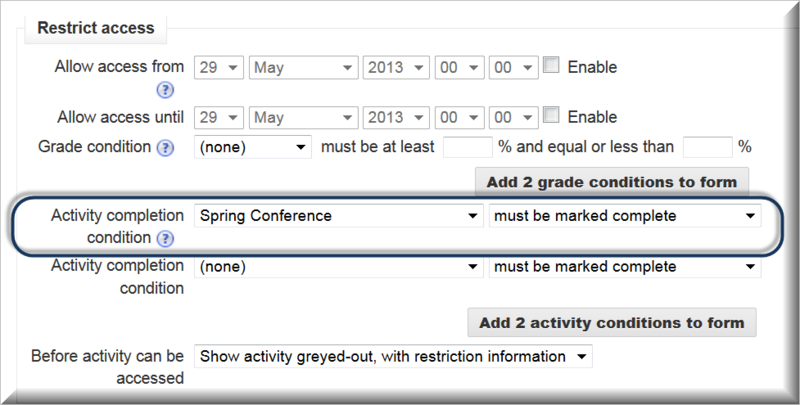 As with other Activities, in the Restrict Access section, select the live event by name from the drop-down list next to the Activity Completion Condition and then select must be marked complete. Then select the preferred option for Before activity can be accessed. Save and return to course. Once a participant is marked as having attended, if his or her attendance is revised to not attended, they will still be able to access restricted content. 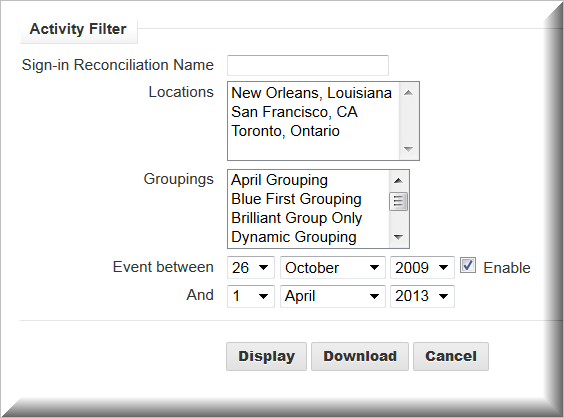 To select multiple Event Locations or Groupings, use control-click. You can Display or Download the report (as an Excel file) from the set-up page but you can’t download the report from the Display page.